Still worry about your privacy? Check out this latest anti-spy unit ideal for anyone who has concerns about privacy defense against eavesdropping, videotaping and fraud: intelligent wireless signal detector camera lens detector. The wireless camera lens detector is an intelligent unit featured the capability to detect wireless eavesdropping devices, camera lens, radio waves as well as phone network signal, call signals and SMS signals. With high level and adjustable sensitivity, the wireless signal detector will shield you against all the typical spy signals within the specified 50-6000MHz around you. 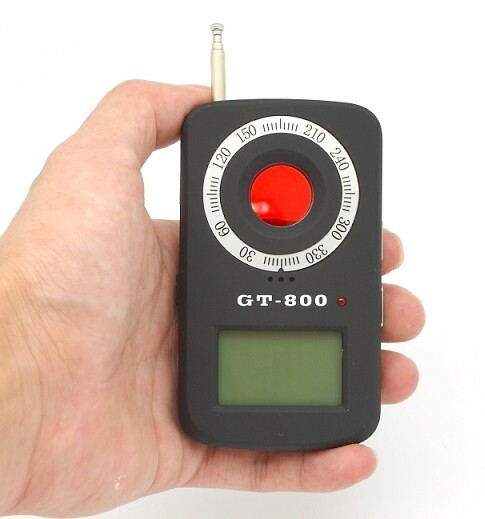 The handheld constructed detector is also easy to use. Powered by built-in rechargeable battery, it can be used in various locations as you wish. Whenever you want to carry out a regular hidden camera sweeping either at home, in the car or in your office, simply turn on the switch. The detector features impressive detection efficiency. It will quickly locate the source of any suspicious signal s and hidden cameras. The detector is definitely one of the best solutions to deal with the variedly advancing spy gadgets and fraud actions. The significance of privacy protection shall never be underestimated nowadays. If you are already aware of that, just take this unit and secure you life. Very fast delivery... only 3 days from China to Qatar. I received just now the product. I am tested and it is very good. I am using it for a couple of days and is a great product!! I can recommended to every one!